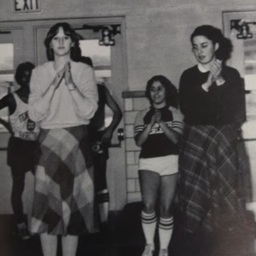 Photograph of several unidentified girls participating in cheer practice at Stonewall Jackson High School in Quicksburg Virginia. 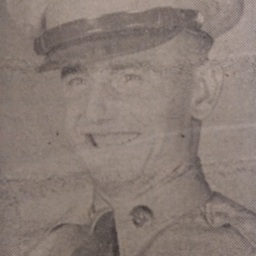 The photograph is taken from that school's 1981 yearbook. Photograph taken by William Hoyle Garber showing Stonewall Jackson High School located in Quicksburg Virginia. 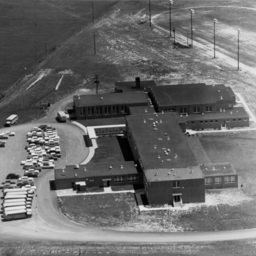 The schools were built in 1959. 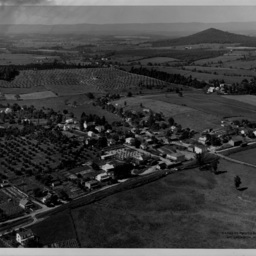 Photograph taken by William Hoyle Garber showing an aerial view of the Quicksburg community taken sometime between 1940 and 1951. 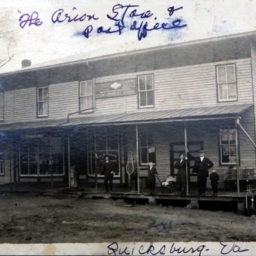 The photograph shows the Arion family on the porch of their store in Quicksburg Virginia. From left to right is an unidentified man, Worthington Arion, Catherine Arion, Bessie Arion, William Arion, and Marvin D. Arion.